A joint research study of the electro-optical properties of BaTiO3 (BTO) films grown on Si by a group at The University of Texas Austin and the group at IBM Zürich. U.S. citizens and permanent residents are eligible. Candidates from underrepresented groups are strongly encouraged to apply. Check out our Recruitment Flyer. March 2017: Elliott returns from Zürich to Austin. Farewell, Elliott! March 2017: Kristy presents at the APS March Meeting 2017 in New Orleans, LA. Feb 2017: Kristy presents posters for NSF-IRES and UT Women in Physics at the UT Graduate Student Recruitment. Jan 2017: Ed presents at SPIE Photonics West in San Francisco, CA. Oct 2016: Graduate Student Elliott Ortmann departs Austin for Zürich. Safe travels, Elliott! Sept 2016: Kristy presents at the 19th International Conference on Molecular Beam Epitaxy in Montpellier, France. April 2016: Ed returns from Zürich to Austin. Farewell, Kurt! March 2016: Graduate Student Edward Lin departs Austin for Zürich. Safe travels, Ed! March 2016: Kristy presents the APS March Meeting 2016 in Baltimore,MD. Feb 2016: Kristy presents posters for NSF-IRES and UT Women in Physics at the UT Graduate Student Recruitment. Dec 2015: Kristy presents at the 46th IEEE Semiconductor Interface Specialist Conference in Arlington, VA.
Dec 2015: Kristy presents at the Materials Research Society (MRS) 2015 Fall Meeting in Boston, MA. Sept 2015: Kristy returns from Zürich to Austin. Sept 2015: Kristy presents at the European Materials Research Society (EMRS) 2015 Fall Meeting in Warsaw, Poland. August 2015: Kurt successfully defends his Ph.D. Thesis entitled, "First-Principles Studies of Perovskite Thin Films and Heterostructures." He now begins a post-doc at Stanford University/SLAC in Jens Norskov's group. Congratulations, Kurt! July 2015: Professor Demkov and Kristy present at the 19th Conference on "Insulating Films on Semiconductors" (INFOS) in Udine, Italy. May 2015: Kurt returns from Zürich to Austin. Farewell, Kurt! May 2015: Kurt presents invited talks at ETH and IBM. May 2015: Professor Demkov, Kurt, and Kristy present at the European Materials Research Society (EMRS) Spring Meeting in Lille, France. 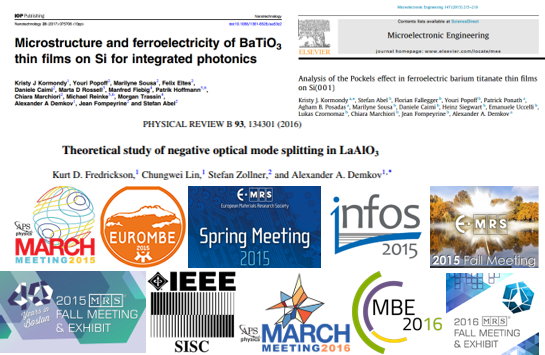 April 2015: Kristy's paper, Analysis of the Pockels effect in ferroelectric barium titanate thin films on Si(001) is published in Microelectronic Engineering. March 2015: Professor Demkov, Graduate Student Florian Fallegger, and Kristy present at the EuroMBE conference in Canazei, Italy. March 2015: Kristy speaks on a graduate student panel for UT's Undergraduate Women in Physics (uWIP) . March 2015: Kurt and Kristy attend the APS March Meeting 2015 in San Antonio, TX. Feb 2015: Kristy presents posters for NSF-IRES and UT Women in Physics at the UT Graduate Student Recruitment. Jan 2015: Kristy returns from Zürich to Austin. Feb 2015: Graduate Student Kurt Fredrickson wins the Ovshinsky Student Travel Award for Materials Physics. Congratulations, Kurt! Oct 2014: Professor Alex Demkov visits IBM ZRL and delivers an invited talk at Paul Scherrer Institut. Sept 2014: Graduate Student Kristy Kormondy departs Austin for Zürich. Safe travels, Kristy!